The dandelions are sprouting their yellow flowers all over our lawn. Some homeowners try to eliminate them. But, for me, they provide perfect golf practice. The last couple of days I've been out clipping of the dandelion flowers with an old Scottish five iron that I also use as a cane. I have been using only my left hand to do this exercise and it is already building added muscle in my weaker left hand and forearm. The trick is to keep clipping those flowers without adjusting your grip. Henry Cotton says that this drill will prove difficult at first for even first-rate golfers. This is because most right-handed golfers are right hand dominant and under-utilize their left side in the golf swing. Give this exercise a try. 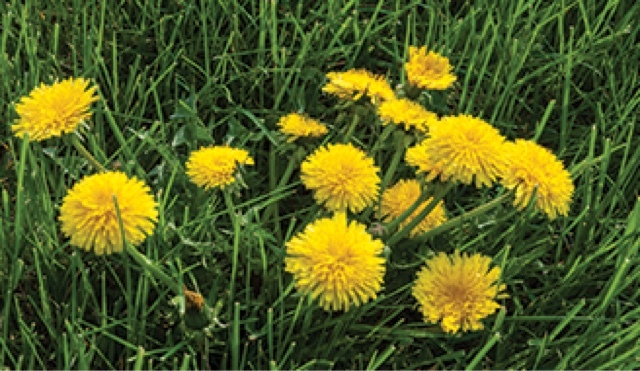 If you don't have dandelions, or clover, try just putting golf tees in the ground and clip the top of them. That was a Harvey Penick drill which he said helped his students learn to square the clubface at impact. He didn't know why it worked, just that it did. Of course you can do this using both hands, or even just the right hand. But, after some practice, you will discover that you actually get more speed and consistency of strike using your left hand than when using your right. Try it. I think you'll like it. Tired of Not Knowing What to Concentrate On?